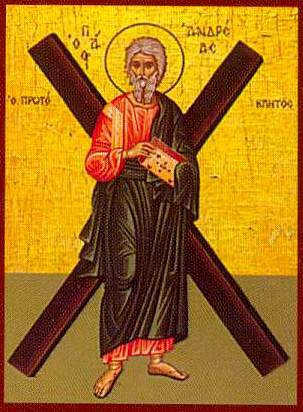 The Commemoration of St. Andrew the First-Called. A sermon preached by Revd Dr Wilhelm Torgerson in the seminary’s Martin Luther Chapel, on Friday, 30 November 2012. Perhaps you’ve heard the question; possibly you have been asked just that: When were you converted? When did you accept Jesus? — through him who knows us before we knew ourselves. And normally we did not come to faith because we sat in a quiet corner of the house and read the word of the apostles in the Bible. Rather there were people in our lives who brought this apostolic message to us, people, who like John the Baptizer, pointed us to Christ and often enough brought us to him. I’m thinking of pious parents and God-parents who taught us how important it is for us to be in fellowship with Jesus. Perhaps there were faithful grandparents, even a pastor, who brought Jesus into our life. Faith comes to us through the word of messengers, true enough. But a statement like that, taken by itself, can be completely misunderstood, as if believing is merely a matter of understanding. Someone tells me something; I understand what he is saying, I assent to what I heard, I express my agreement. Accordingly faith is like an intellectual process by which I decide to connect with Jesus. The Evangelist tells us a different story. So how does the faith come to man? Yes, certainly as we heard, through the word spoken by messengers. “So faith comes from hearing” (Rom 10:17) – by the way, Luther translates: faith comes from preaching, from proclamation; and that is, of course, exactly what is meant. But faith also comes from being where Jesus is, where you are in his presence, where he bestows all those spiritual benefits that he so richly dispenses, not only in proclamation of the word, but also in the sacraments. The connection given there is more than any of our brain cells can fathom. Do you realize now how important ‘Gottesdienst’ is, being at church when and where Christ is present to shower on you all the benefits that can change your life and lead it to fulfillment? Being at the church’s worship service is not some onerous and irksome duty – I have to do something, get up early, be on the way. Rather in church you’re at the receiving end, God in a very concrete and real way bestowing on you all his love through the means of grace. Peter. The text is not talking about the fact that Jesus used his eyes for 20/20 vision to take note of the scenery or the people around him. When Christ Jesus looks at us, it goes much deeper, for he looks at us as someone who know us before we knew ourselves. Andrew doesn’t even have the opportunity to introduce his brother Simon Peter to the Lord. Jesus looks at him – and knows him, knows his name, what kind of person he is, what to make of him. And makes him new by giving him a new name and taking him into his service. Again, not we come to faith, as St. John makes abundantly clear with this story. Long before we had the idea to say yes to Christ Jesus, long before then he saw us and chose us. St. Paul says: “God chose us in Christ before the foundation of the world” (Eph 1:4). So indeed our faith in Christ is not based on our decision and free will; it is the gift bestowed on us by the Holy Spirit. Father Luther taught us: “I believe that I cannot by my own reason or strength believe” (Small Catechism III). It is Christ’s will that we believe. He saw us, he called us by name in holy baptism, he called us to faith. And having been called – like St. Andrew and the many others then and now – we join the fellowship of those who went before, who are now with us on the way of discipleship, and with those who will come after us, ever listening to his call and invitation, always receiving the means by which Christ keeps in the one true faith to everlasting life. Amen.